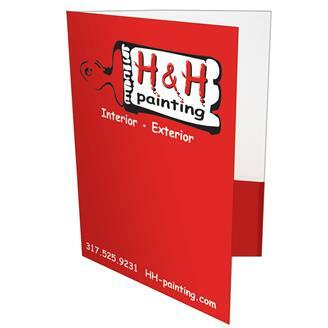 Presentation folder with two glued 1/4" gusset pockets, 9" x 12". RIGHT SIDE pocket has a slit for inserting a busines card. Heavy 14 pt. high density white paper board. Liquid laminated front for a high gloss finish and uncoated second side. Perfect for holding larger volume papr documents.